This Permian Producer is HAPPY About Huge Discounts…How Strange is That? Here is something that you wouldn’t expect. Permian Basin oil producers are selling oil for $20 per barrel less than Brent pricing price…yet the largest producer in the Permian couldn’t be happier about it. 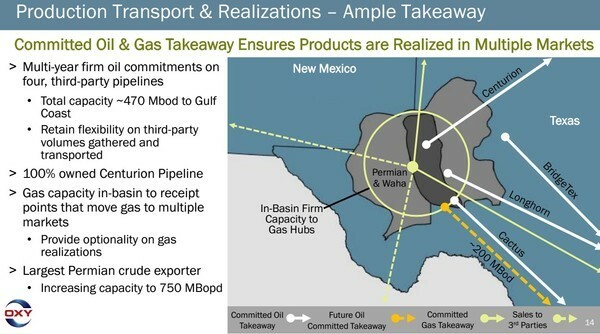 As soaring Permian production overwhelms takeaway capacity and decimates Permian oil prices Occidental Petroleum (OXY-NYSE)—with 300,000 barrels per day plus of Permian production—is set to score a billion dollar plus cash windfall. We have seen this movie again and again and again in the North American oil business. Too much production and too few pipelines creates big problems. Up here in Canada it is an ongoing issue. The country has lost billions of dollars due to lack of pipeline capacity. It happened in the Bakken too in the early years of this decade. Now it has reappeared in the Permian (it already happened here before) in a major way with Midland – WTI differentials recently blowing out to as wide as $15 per barrel from West Texas Intermediate pricing. And remember that is on top of the $10 per barrel discount that WTI trades at to Brent pricing. Permian producers are getting $20 per less from each barrel of production than their global competition. Quite frankly I’m sick and tired of watching this industry fritter away so much money……which is why the Occidental Petroleum story is so refreshing. OXY is a huge operator in the Permian, in fact the single largest producer in the region. In total the company has 1.4 million net acres that are spread across the entire Permian region—the Delaware and Midland Basins plus the Central Basin Platform and New Mexico Northwest shelf. OXY has 650,000 net acres across the booming Delaware and Midland Basins that are now main focus of the industry. I wouldn’t mind having a few of those given that acreage prices in the best spots are as high as $60,000 per acre! That land has tremendous value—but that’s not all the competitors are admiring about OXY these days. It isn’t the 300,000 plus barrels per day of production either. If it’s not the land or production…what could it be you ask? What has everyone green with envy is…the fact that while OXY has 300,000 plus barrels per day of Permian production the company has 470,000 barrels per day of committed pipeline capacity to the Gulf Coast. That is considerable more takeaway capacity than OXY needs. With everyone else desperate to get their oil to market OXY management has the ability to sell that excess capacity for a considerable profit, given current marketing conditions. In addition to excess pipeline capacity OXY also has the Port of Corpus Christie Ingleside Energy Terminal. Ingleside has approximately 2.1 million barrels of total oil storage capacity and opens up global oil pricing for OXY through export capacity of 300,000 barrels per day (with plans to expand to 750,000 barrels per day). Finally a North American producer that isn’t landlocked! How Big Is This Cash Windfall Going To Be? Occidental’s midstream assets don’t just act as a hedge against Midland differentials blowing out. The company is actually profiting from these wide differentials. That is pretty incredible considering OXY is producing over 300,000 barrels per day in the Permian. The company makes more money specifically because of the widening of differentials. And I’m not talking about small dollar amounts here. OXY just came out with updated 2018 guidance. The company increased the anticipated operating income from its Midstream/Marketing division to a range of $900 million to $1.1 billion. That revised guidance was specifically due to wider WTI-Midland discounts relative to Magellan East Houston pricing. The new guidance is up from an initial range of only $200 – $300 million……so that is a cool $800 million increase for 2018. As I said —– big dollars — $$$$. But I think that even with this large increase that they have sandbagged their guidance. That new $900 million to $1.1 billion Midstream operating income range is based on differentials of $6.00 to $6.75 per barrel. That seems awfully conservative given that the differential was recently as high as $15 per barrel and based on what the market is forecasting. The futures market currently expects the differential to be in the double digits through at least August of 2019. 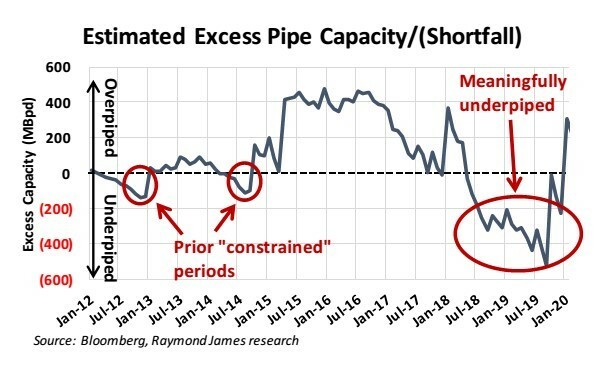 The view is based on what appears almost certain to be a significant shortfall of Permian pipeline capacity until late in 2019. For the rest of 2018 the average differential is pretty close to $15 per barrel. OXY has told the market that each $1 per barrel increase in the differential creates an additional $120 million of cash flow for the company. Therefore if the differentials do turn out to be closer to the $15 the market is forecasting instead of the $6.00 – $6.75 in OXY’s guidance….. the company could be looking at another $1.5 billion of operating income over the next 12 months. In 2018 alone OXY will likely be up another $800 million on top of the $800 million increase in 2018 guidance OXY already came out with. Combined that would mean that these wide differentials are going provide OXY with a $1.6 billion cash windfall in 2018 and more to come next year……at least another $1 billion in 2019 based on the current future strip. Occidental Petroleum is company with a $60 plus billion market cap. Is a cash windfall of a couple billion dollars significant? The answer would be yes! In 2016 entire cash flow from operations was only $2.5 billion. In 2015 cash flow from operations was only $3.2 billion. Yes those were low oil price years, an alternative views are that this extra cash covers OXY’s entire dividend for this year or more than half of the company’s capital spending. Any way you slice it this is a material lump of cash for Occidental Petroleum. Great to see huge diffs work in favour of a producer…even if it’s a behemoth like Occidental. All Hail The King of Free Cash Flow in the OilPatch!